NEW YORK (Reuters) - How can creatures as different in body and mind as present-day humans and their extinct Neanderthal cousins be 99.84 percent identical genetically? Four years after scientists discovered that the two species' genomes differ by a fraction of a percent, geneticists said on Thursday they have an explanation: the cellular equivalent of "on"/"off" switches that determine whether DNA is activated or not. Hundreds of Neanderthals' genes were turned off while the identical genes in today's humans are turned on, the international team announced in a paper published online in Science. They also found that hundreds of other genes were turned on in Neanderthals, but are off in people living today. Among the hundreds: genes that control the shape of limbs and the function of the brain, traits where modern humans and Neanderthals differ most. "People are fundamentally interested in what makes us human, in what makes us different from Neanderthals," said Sarah Tishkoff, an expert in human evolution at the University of Pennsylvania, who was not involved in the new study. Discovering the differences in gene activation is "an amazing technical feat," she said, and goes a long way to answering that riddle. The discovery also underlines the power of those on/off patterns. Together, they add up to what is called the human epigenome, to distinguish it from the human genome. The genome is the sequence of 3 billion molecules that constitute all of a person's DNA while the epigenome is which bits of DNA are turned on or off even as the molecular sequence remains unchanged. In the last few years, research on the epigenome has shed light on how gene silencing leads to cancer, for instance, and how identical twins with identical DNA sequences can be very different. The epigenome exerts such powerful effects that it is often called the "second genetic code." Now it has offered clues to what makes modern humans distinct. For the new study, geneticists led by Liram Carmel of the Hebrew University of Jerusalem started with DNA from limb bones: those of a living person, a Neanderthal and a Denisovan, an extinct human that lived in Eurasia during the Stone Age and whose remains - a pinkie bone and a tooth, from a cave in Siberia - were not discovered until 2010. Geneticist David Gokhman and others on the Israeli team then examined the DNA's on/off patterns, identifying about 2,200 regions that were activated in today's humans, but silenced in either or both extinct species, or vice versa. When a gene is silenced, it does not produce the trait it otherwise would. Chief among the epigenetic differences: a cluster of five genes called HOXD, which influences the shape and size of limbs, including arms and hands. It was largely silenced in both ancient species, the scientists found. That may explain anatomical differences between archaic and present-day humans, including Neanderthals' shorter legs and arms, bowleggedness, large hands and fingers, and curved arm bones. Calling the work "pioneering," and "a remarkable breakthrough," paleoanthropologist Chris Stringer of the Natural History Museum in London said in an interview that the HOXD gene finding "may help to explain how these ancient humans were able to build stronger bodies, better adapted to the physical rigors of Stone Age life." One caveat about the research is that one person's epigenome can vary markedly from another's due to diet, environment and other factors. It is therefore impossible to know whether the on/off patterns found in Neanderthal genes are typical of the species overall or peculiar to the individual studied. Other DNA with big differences in on/off patterns between the extinct and present-day humans is associated with neurological and psychiatric disorders including autism, schizophrenia and Alzheimer's disease. More of the Neanderthal versions were silenced. In an interview, Carmel speculated that any given gene might "do many things in the brain." When dozens of brain-related genes became more active in today's humans, that somehow produced the harmful side effect of neurological illness. 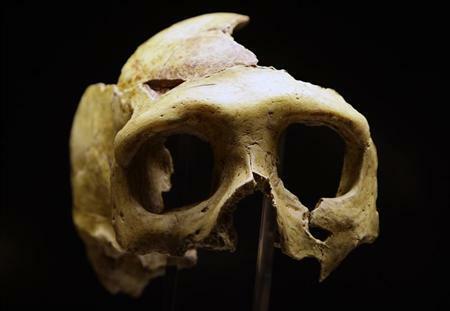 But the main effect might have been the astonishing leap in brain development that most distinguishes modern Homo sapiens from our extinct cousins.